Many businesses are intimidated by the perceived complexities of the “Internet of Things” / IoT. Integrators of ALTA wireless sensors learn quickly that many of the barriers that have hindered IoT integration in the past have been overcome by the long range capabilities of the ALTA Wireless IoT Sensors Platform. RF performance is all about “link budget”. Link budget is measured decibels and factors all the gains and losses between wireless system transmitters and receivers. The formula includes variables such as power output, receiver sensitivity, antenna gain, interference (both radio and physical) and cables. Monnit has fine-tuned its radio technology to yield phenomenal range from minimal power output and consequently draw minimal power from batteries. Rock solid and groundbreaking science is embedded in each sensor. When building a wireless sensor system – ultra long wireless range might be the standout feature of the ALTA Wireless IoT Platform – then long battery-life and bank-grade security round off the trifecta. When factoring these three features – Monnit’s ALTA Wireless IoT Platform has no peers – not even close. No where else in the world exists a wireless sensor that yields 1000`+ wireless range, 10-year battery life and 256 EDCH / 128 AES security. There are other features of course (On-board Data Memory, Over-the-Air Updates, FCC/CE Certifications, No Monthly Fees, etc. ); but range, battery life and security are the signatures that set ALTA apart from any other solution. Here are 10 select kits that are listed to help get your mind around the possibilities of wireless IoT – these sensor kits typically can be setup-and-saving in less than 15 minutes. 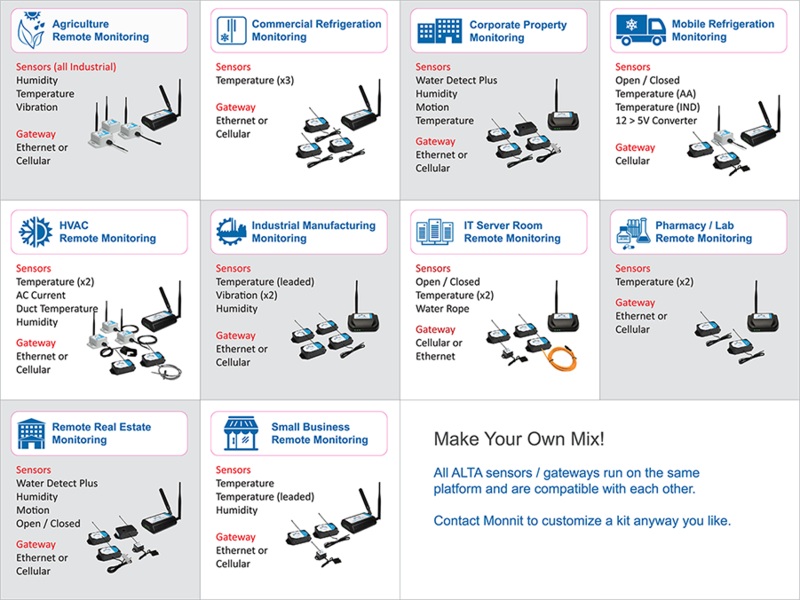 Click image to learn more about the ALTA Wireless IoT Kits. SALT LAKE CITY, UTAH – June 20, 2017 – Monnit Corporation (www.monnit.com) today announced it has signed a distribution agreement with Arrow Electronics to bring Monnit’s new ALTA™ wireless sensing solution to market and help meet the growing demand for high-performing, comprehensive Internet of Things (IoT) solutions. Monnit’s solutions enable enterprise and small- and medium-size customers to connect, monitor and control a myriad of functions within their businesses, leading to operational efficiencies, reduced risk and increased profitability. “Monnit’s ALTA platform offers secure and reliable capabilities at an affordable price. Our collaboration with Monnit will bring profitable new IoT opportunities to Arrow’s customers,” said Aiden Mitchell, vice president of global IoT solutions at Arrow. In addition to offering four times the wireless range (1,000+ feet, non-line-of-site) and much stronger battery life than traditional sensors (10 years on two AA batteries), ALTA products use Monnit’s new Encrypt-RF™ bank level security. The sensors will be available through application specific monitoring kits with either cellular or Ethernet connectivity, including; Commercial Refrigeration, Remote Real Estate, HVAC, Pharmacy/Lab, IT Server Room, Corporate Property, Agriculture, Mobile Refrigeration, Industrial Manufacturing and Small Business, with more coming soon. Through Monnit’s IoTvantage™ partner program (www.monnit.com/partner), business partners can private label the solution to sell as their own. Custom kitting, product development and customized software features are also available to help tailor the solution for their customer’s specific needs. Monnit is a leader in the design and manufacturing of turnkey, self-installed, low-cost wireless sensor solutions targeted at the industrial and commercial markets. Monnit’s sensing solutions are easily installed and used by anyone wanting to remotely monitor information and activities around a variety of variables (i.e. temperature, motion, humidity, vibration, etc.) and receive alerts based on user-defined conditions. Monnit products are fully tested, FCC, CE and IC compliant for use anywhere in the world. For more information, visit www.monnit.com. Click on the graphic above to view the entire IoT Sensors Map (PDF). 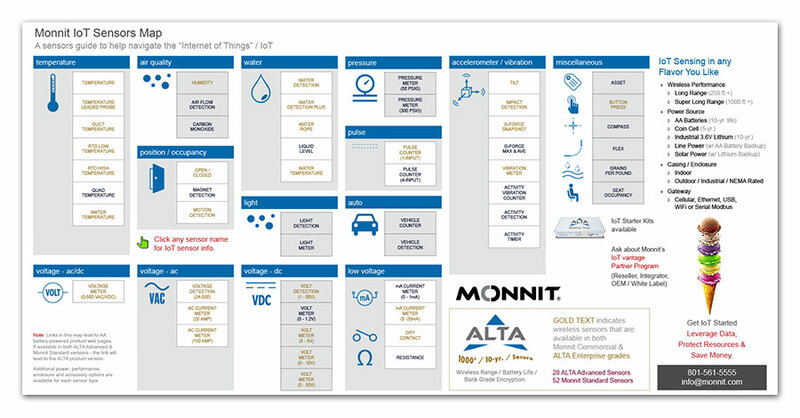 ALTA Advanced and Monnit Standard products are listed in the categories in which they are applied in IoT (“Internet of Things”). Each sensor entry links to its respective product page (all links point to web pages that show AA battery powered products – additional power, wireless performance, enclosure and accessory options are available for each sensor type). HUNT VALLEY, Md.–(BUSINESS WIRE)–Jun. 15, 2017– TESSCO Technologies (NASDAQ: TESS), a value-added distributor and solutions provider for the wireless industry, today announced a partnership with Monnit Corporation as part of Monnit’s new IoTvantage™ – Premiere IoT Partner Program. TESSCO will sell Monnit’s wireless sensors to value-added reseller, system integrator partners and enterprise customers in North America. TESSCO will focus primarily on distributing Monnit’s ALTA wireless sensors, the only wireless sensor platform available today that offers 1,000+ feet wireless range (non-line-of-sight), 10+ year battery life and integrated bank-level security. The sensors are available via 10 market specific application kits (with either cellular or Ethernet connectivity); Commercial Refrigeration, Remote Real Estate, HVAC, Pharmacy/Lab, IT Server Room, Corporate Property, Agriculture, Mobile Refrigeration, Industrial Manufacturing and Small Business. In addition to offering four times the range and much stronger battery life than traditional sensor platforms, ALTA products use Monnit’s new Encrypt-RF™ bank level security, featuring a 256-bit exchange to establish a global unique key, and AES-128 CTR for all data messages. Monnit leads the Internet of Things by empowering businesses with easy-to-use, low-cost remote monitoring solutions. Monnit solutions can be used to: remotely monitor a variety of “Things” (i.e. temperature, motion, humidity, vibration, etc. ); alerting you via text, email, and/or phone call when something goes wrong. For more information, visit www.monnit.com. SALT LAKE CITY, UTAH – June 13, 2017 – Monnit Corporation (www.monnit.com) today announced its Premiere IoT Partner Program – IoTvantage™. The program provides business partners (Distributors, Value Added Resellers, System Integrators, Independent Software Vendors, Managed Service Providers and OEMs) a fast track for connecting their customers to industry-leading IoT solutions. The kits feature Monnit’s ALTA enterprise wireless sensors, the only wireless sensor platform available today that offers 1,000+ foot wireless range (non-line-of-sight), 10+ year battery life and bank-level security (Monnit’s new Encrypt-RF™ integrated security). Monnit’s IoT solutions are comprehensive and feature all of the hardware and software needed without requiring any additional subscriptions or monthly fees. Also key to Monnit’s IoTvantage program is the ability for partners to private label and sell the solution as their own. Custom kitting, product development and customized software features are available to help partners tailor the solution for their customer’s specific needs. For more information on the new IoTvantage Business Partner Program, call (801) 561-5555 or visit www.monnit.com/partner. Monnit is a leader in the design and manufacturing of turnkey, self-installing, low cost wireless sensor solutions targeted at commercial and industrial markets. Monnit’s sensing solutions are easily installed and used by anyone wanting to remotely monitor information and activities around a variety of variables (i.e. temperature, motion, humidity, vibration, etc.) and receive alerts based on user defined conditions. Monnit products are fully tested, FCC, CE and IC compliant for use anywhere in the world. For more information, visit www.monnit.com. Salt Lake City, Utah – June 06, 2017 – Monnit Corporation (www.monnit.com) today announced the release of six new ALTA wireless sensors. ALTA is the leading enterprise-grade Internet of Things (IoT) solution specifically designed to meet bigger, higher-demand requirements. ALTA offers four times the wireless range (1,000+ feet, non-line-of-site) and much stronger battery life than traditional sensors (10+ years on two AA batteries). ALTA products also use Monnit’s new Encrypt-RF™ bank level security, featuring 256-bit exchange and AES-128 CTR for all data messages. ALTA Wireless Infrared Motion Sensors use infrared sensing technology to accurately detect movements made by people or larger animals within 16.4 ft (5 m) range. ALTA Wireless Voltage Detection Sensors – 500 VAC notify of the presence or absence of electricity up to 500 volts AC. ALTA Wireless Accelerometer – Tilt Sensors display measurements for pitch and roll (0 to 180° -> -180° to 0°). ALTA Wireless Accelerometer – Impact Detect Sensors alert when g-forces are exceeded by a user defined threshold – up to 8 g-force. ALTA Wireless Accelerometer – G-Force Snapshot Sensors activate at a set time interval (defined by user) and measures g-force along X, Y and Z axes. ALTA Wireless Accelerometer – Vibration Meters measure g-force on 3 axis and displays speed and frequency of vibration. Monnit treats your sensor data in the “Internet of Things” (IoT) the same way your bank treats your money – not a single breach is tolerable – EVER – NOT ONCE! As part of the ALTA IoT Platform, Monnit integrates ECDH-256 (Elliptic curve Diffie–Hellman) public key exchange and AES-128 symmetric key encryption on all sensor data. The more battery-exhausting ECDH-256 encryption is used during initial linking of devices and the more battery-friendly AES-128 encryption is used for all subsequent RF data packets. This combination provides integrators the best of both worlds – – bank-grade security and outstanding sensor battery life (ALTA sensors yield 10-year battery life when powered with 2 AA batteries or 1 industrial lithium battery). Wireless sensor networks (WSNs) built on Monnit’s ALTA IoT Platform provide bank-grade security at every level. In a study conducted by the Ponemon Institute, 533 enterprise IT decision-makers were surveyed. 76% of the respondents believed their organizations were likely vulnerable to cyber-attacks executed through IoT (src: “The Internet of Things (IoT): A New Era of Third-Party Risk”). Monnit extinguished the threat of cyber-attacks within the architecture of the ALTA wireless IoT sensor platform. We Ain’t Scared of No Botnets! A large portion of the IoT headlines are focused the DDoS (Distributed Denial of Service) attacks facilitated and propagated by botnets (botnet = a network of private computers infected with malicious software and controlled as a group without the owners’ knowledge). Remote cameras have been one of the most commonly hijacked device types and are easy prey for IoT hackers – because they often run Linux operating systems that are not properly protected. ALTA sensors are not vulnerable to weak passwords or OS-related breaches. ALTA gateways run on a purpose-built real-time operation system without any external administrative access to the device. ALTA IoT systems are protected by multiple layers of security and encryption. Would be hackers would have better luck finding a needle in a haystack than cracking ALTA encryption keys. Each individual ALTA device uses an embedded TRNG (True Random Number Generator) to achieve a high guarantee of statistical uniqueness for each ECDH key set. ECDH allows any two devices to create unique, link-specific keys between them. ALTA only uses one 256-bit key exchange for every sensor linked to a gateway. No other data is sent using the 256-bit keys. Therefore, would be hackers only have a very small dataset in which to attempt brute force attacks. The ALTA platform provides infinitesimally small key exposure. 128-bit encryption is used for all subsequent RF data packets. This encryption method supports over 50,000 data messages before enough of a dataset is generated to enable brute force optimizations. At 10 minute data intervals, this equates to an entire year of dedicated observation before key exposure becomes slightly more likely (refer to “Birthday Attack” probability, P = 10 ^-18, then 10^-15 after one year –> for the non-techies: the probability of someone finding the key goes from 1 quadrillion:1 to 1 trillion:1). A hacker would have to be physically present within range of the wireless sensor network for one year to get this low probability benefit – dedicated solely to cracking a single key for just one sensor – Ha! To mitigate further the issues surrounding key exposure, integrators can use the ALTA platform to refresh keys once every year. To add to the futility of cracking one link-specific key, no shortcuts can be realized by the exposure of one device’s key. The same work it requires to crack one key will be required again to crack the next. Any device that runs on an operating system is vulnerable to attack. ALTA gateways are “purpose-built devices” that are built for a specific task and do not contain an operating system. Due to the absence of an OS (Linux, Embedded Windows, etc. ); ALTA sensors are not vulnerable to weak passwords or OS-related breaches. The ALTA gateways run on real-time “C” code without any administrative access to the device. An IoT system is only as strong as its weakest link and communications between servers and browser are every bit as critical to protect as the other layers in the WSN. ALTA IoT networks employ iMonnit software for interfacing between network administrators and sensor networks. The iMonnit interface is secured using TLS (Transport Layer Security) encryption. TLS is a protocol that provides privacy and data integrity between applications. It is used for web browsers and other applications that require data to be securely exchanged over a network. Keys are established using standard Diffie-Hellman key exchange. Businesses should be aware of the threats that have corrupted IoT systems in the past. Hackers crashed the IoT stage with malware and botnets such as BASHLITE, Luabot and Mirai and Brickerbot. These attacks made headlines; but they were only able to exploit weak and unprotected systems. Integrators should take courage in the fact that their sensor data will always be safe and protected when measures of security and encryption are properly executed. Monnit engineered the ALTA IoT Platform with the dangers of hacking in mind. Every device, wireless link and user interface in the ALTA IoT Platform are protected by Monnit Encrypt-RF™ Security.